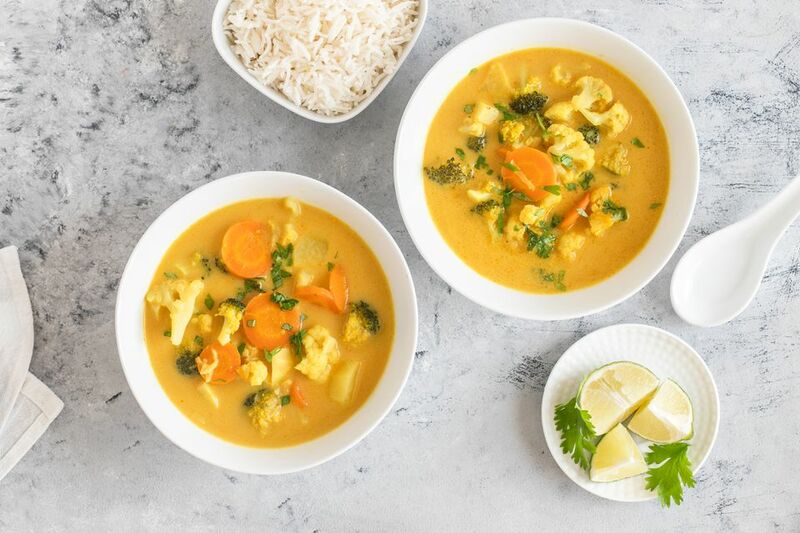 If you like exploring different vegetarian and vegan Thai food recipes at home, you'll definitely want to give this simple and easy yellow Thai curry recipe a shot. It's made with coconut milk, potatoes, broccoli, fresh ginger and plenty of spices. What makes this simple homemade vegan curry recipe so easy and quick to prepare is that there is no need to use a store-bought or pre-made curry paste in this vegetarian yellow Thai curry, as this recipe is seasoned and colored with curry powder, turmeric, and chili sauce. If you're new to vegetarian cooking or Thai food cooking, this is a simple recipe to start out with. It also makes for an easy weeknight vegetarian dinner idea. Pair it with some white rice or quinoa, or, make it even easier on yourself and use some instant rice and you've got dinner on the table in just a few minutes. First, place the coconut milk and vegetable broth in a large pot and give it a quick stir. Bring the mixture to a slow simmer. Add in the pre-cooked or leftover potatoes, carrots, broccoli, and cauliflower (or whatever vegetables you are using) and allow the mixture to simmer for a few minutes, stirring once or twice. Add in the ginger, sugar, garlic, turmeric, curry powder, chili sauce, and salt and stir to combine well. Allow your yellow curry to continue to cook over medium-low heat for 3 to 5 more minutes, or until the vegetables are all tender. Taste, and adjust the seasonings to taste. You may want to add a bit more salt, or a squeeze of fresh lime juice or top it all off with some fresh chopped cilantro for serving. Serve your prepared yellow curry over rice if desired.